WASHINGTON, D.C. (Black PR Wire) – Recently, Campaign Legal Center (CLC) released a first-of-its-kind online tool RestoreYourVote.org to help as many as 23 million citizens with past felony convictions understand their voting rights in all 50 states and take the necessary steps in the process to exercise their right to vote before the November 2018 election. A majority of this group of Americans – as many as 17 million people – should be able to vote right away if they just understand their rights. Many more are eligible to apply to restore their right to vote. CLC hopes to educate as many people as possible between now and the election by providing an online roadmap for rights restoration. Felony disenfranchisement laws target primarily people of color, preventing them from having a voice. Many of these laws are explicitly racially discriminatory policies of Jim Crow. Nationwide, one in every 13 Black adults cannot vote as the result of a felony conviction. That is compared to one in 56 non-Black adults. As we launch the online tool today, CLC is also launching grassroots organizing efforts in several states to educate voters, beginning in the states of Arizona, Nevada, and Texas. These states were chosen because of their large population of people that can vote if they understand their rights but an equally large amount of confusion around the law. 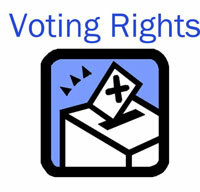 Visit RestoreYourVote.org to learn about the path to rights restoration.